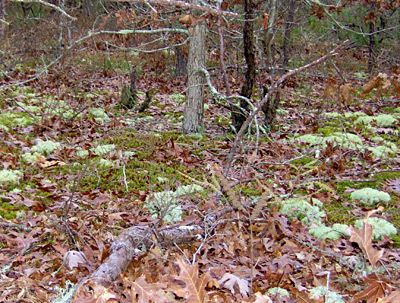 The woods of Rodriques Bogs in East Falmouth have deeply rutted roads from an earlier time, when the parcel was part of larger holdings farmed by Manuel Roderick and his wife, Marie, in the early 1900s. When Paulino Rodriques sold the 23.6 acres to the town in 2000, he asked that they be dedicated to his grandfather, who was always referred to as “Ol’ Man Roderick.” The nickname is engraved on a boulder at the area’s entrance on Old Waquoit Road. The narrow parcel slopes down to a cranberry bog on Bournes River. A red-tailed hawk keening above and deer tracks in the sand seem far removed from the heavy traffic of East Falmouth Highway, and yet the cars are visible in the distance at the southern end of the bog. Manuel Roderick came to New Bedford from the Cape Verde Islands aboard a whaler when he was a teenager. He picked strawberries in Falmouth in 1898 and 1899, and a year later he and his wife moved here. They worked in the cranberry bogs and farmed their land. It was a better life, he said later, than seafaring and work in the mills. Old Waquoit Road is off Old Barnstable Road, just north of Lodengreen Drive. Parking for two or three cars is available down the road to the right, adjacent to the boulder.